How will the controversy over Islamic women wearing veils end? The debate about religious freedom v society's norms has strong similarities to a row that engulfed 16th Century England, says Steve Tomkins. These may seem like unfamiliar and uncharted waters that British society is moving into - controversy over religious clothing, and fearful tensions between a religious minority and the mainstream. In fact, we've been here before, 400 years ago - or somewhere uncannily like it. In the days of Elizabeth I and James I/VI, the English church was riven by the Puritan controversy. The main issue - at least on the surface - was what ministers should wear: traditional robes or ordinary clothes. The difference is that then it was the establishment that demanded distinctive clothing and the radicals - the Puritans - who insisted on everyday wear. The government came down fairly strongly on the dissidents. Religious ministers who refused to back down and button up were sacked. 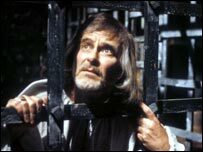 Shakespeare's Malvolio, played here by Alec McCowen, was mocked as a "Puritan"
Then as now, public opinion was divided on the subject. Puritan ministers were supported by a sizeable minority who hated what they called the "Popish rags" and demanded freedom of religious conscience. Others hated and feared Puritans as dangerous fanatics dividing English society. Puritans talked about freedom of conscience, it was said, but if they got into power wouldn't they just impose their own narrow-minded scruples on everyone else? One such critic was Shakespeare. In a Daily Star moment in Twelfth Night, he has Malvolio described as "a kind of Puritan", to which Sir Andrew Aguecheek replies, "O, if I thought that, I'd beat him like a dog." You can just imagine the response that line would have got - especially as Puritans wanted to close the theatres. Then again, others thought the whole issue of religious clothing was completely trivial, and ought to blow over quickly. "It is scarcely credible how much this controversy about things of no importance has disturbed our churches," said the Bishop of London. But it did not blow over. It dragged on for decades, and exploded spectacularly in the English Civil War in the next century. The problem was that though the issue of religious clothing seemed superficial, it was in fact just the surface of much deeper disagreements, religious and political. Religiously, Puritans saw the robes as a revival of Roman Catholicism by the back door - a religion they violently opposed as anti-Christian blasphemy. For the establishment, the robes represented a moderate religion that combined the best of old and new. This provides a valuable perspective on today's debate. Seemingly trivial disputes about religious togs can mask a conflict between whole world views. To one side, it was obvious that good religion is moderate, middle of the road and orderly. To the other, it was equally apparent that true religion demands radical purity and commitment, and so-called "moderation" meant compromise with the powers of darkness. Politically, the most radical Puritans came to see the robes as an emblem of a whole godless society, while the government increasingly saw non-conformity as dangerous fanaticism, capable of overthrowing the state. It is worth noting the results of the government's refusal to meet the Puritans halfway - or anywhere at all. 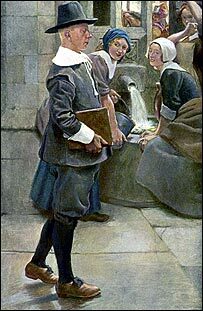 The Puritan movement was split, more moderate Puritans accepting the status quo, while the most radical quit the Church of England and started their own churches. This is where the non-conformist denominations, such as the Baptists, first began. Separatist leaders were executed in 1593. Surviving followers fled the country to Amsterdam, and eventually to north America on the Mayflower. Why did the government react so violently against people whose only crime was not going to church? The answer has further resonances with today's situation. Twenty-five years before Elizabeth became Queen, a group of radical Protestants seized the German city of Munster, a move which ended in the deaths of thousands. This horror traumatised Europe, and from then on all radical Protestants were suspected of plotting such acts of terror. The English separatists were in fact totally peaceable, but were damned by association. Additionally, the more they were shunned by mainstream society, and the longer they separated from it, the more extreme and implacable their condemnation of it became. On a more optimistic note, however unsympathetic the radical Puritan movement may seem today, it brought forth from one of its leaders, Robert Browne, the first defence of universal religious freedom in British history. A reminder, perhaps, that even those who seem to take indefensible positions on controversial issues can have something valuable to say. Steve Tomkins is author of A Short History of Christianity. The bottom picture in this article also shows that at the time it was considered unseemly for a woman to be in public without a cap covering her hair, or for a man not to wear a hat in public. Fortunately, our society and religion has moved on from the premise that it is what wear that makes you a decent person, to making the determination on what you do. Only someone from the BBC could stretch such a parallel. Freedoms - religious or otherwise are part of the preveliges of this country. For example, If we, the citizens, dont like the politics then it is enshrined that we have the choice to change it. Now one of the things that does exist is the freedom of choice. If the veil is chosen to be worn then the choice is to dispence with the service. Its choice - live with it. We all would if we went somewhere else to live. What complete nonsense - not remotely an analogy! The veil problem for me is not a religious question but its extreme aspect when the face is covered frightens me by its radicality and its dangerosity for so many reasons . One of them is the question of the security when you can only see a ghost . I understand what it means to be protected against wind and sand and sun when the veil is traditionnally used in a geographic area with an extreme climate ,but it must be necessary to change a tradition in another country where the climate is mild and does not need a so extreme protection . It could be also more polite for the new social environment . Scarfs and other small veils women wear for religious ideas can be very lovely and have to be respected . Just wonderful! This story just proves again that you can't know where you're going unless you know where you've come from, historically, and emphsises the huge importance of learning from our past! As a history student, it's nice to see the study of that discipline lead to important messages for modern society. Obviously, it's impossible to make a direct comparison between English puritans in the sixteenth century and modern Islamic fundamentalists, but it can't be denied there are some important similarities. Overall, an intelligent and thought-provoking article. I would just like to say it doesn't say in the Koran that weman should wear vails. It's how they interpret whot it says. The way Muslim women dress is personal choice as is what religion one believes in and how seriously they observe it. Thus any restrictions would be an impingement on individual liberty and hence violation of an individual's human rights. Surely there is a very important difference? The conflicts in 16th century Europe were between various branches of Christianity. The current situation is caused by the demands of a religious minority at odds with a largely secular majority. While the religious minority are organised the secular majority have no unifying body. Is it not now time to re-open the debate on the dis-establishment of the Church of England? Are there not lessons to be learnt from countries such as France (and to some extent the USA) where an openly secular state reflects reality and relegates religion to a matter of individual conscience? I think that everyone should have freedom of religion but if that religion spills over into terrorism, then the persons who are involved in instigating violence should be prosecuted, not the followers of any religion. The veil issue is complicated because I wouldn't want my family members to wear one, but at the same it would be bigotry to stop someone from wearing it. They are not saying everyone should wear one, they are just saying they want to wear it. And as was mentioned above they are guilty through association. Mr Tomkins misses a key point. The issue in the 16th century was almost wholly religous. With the veil there is large element of cultural difference as well; the differing groups today come from substantially different cultural and ethnic backgrounds, this was not true 400 years ago. Today we have differing groups that are converging and overlapping rather than divurging from a common starting point. Herin lies the problem. This veil issue as a symptom of lack of intergration. This is what needs to resolved - if you join a club (ie the UK) then you largely are obliged to honuor its rules and traditions not change them without democratic(majority) agreement to the changes. This article is drifting away from the central point of contention , viz the veil. No veil because we all need to be identified by our face , for PASSPORT , CAR LICENCE or simply to know who is talking . I saw the interview on the news television , but do not know who was speaking , there was no identity ! How can Steve Tomkins claim this has any similarity? This is just someone at the BBC short of a story or trying to promote his book? The problem most of us have with a veil is that it covers the face; it causes segregation, lack of communication and is not wanted by the majority of our society. The fact that it is tied to a religion is not the point. Most of us would campaign equally against hoodies or any face hiding fashion, especially if employed in public service. If muslims want to live in the Uk they should respect our laws and customers and remove the veils. This story, while being very interesting, has nothing to do with the current controversy - I understood the issue to be one of covering the face and not what a person should wear. In the interest of security as well as manners it should be against the law for anyone, irrespective of race or religion, to walk around with the face covered. If certain cases are allowed anyone who doesn't want to be recognised (eg criminals and terrorists) would take advantage to carry out their criminal pursuits. Steve makes a very good point. Here in Scotland similar attitudes persist. Some years ago, our minister began to wear somewhat colorful vestments, including a large wooden cross around his neck. Congregational mutterings arose, and a perfectly good minister moved on. This is not just about religeous identity, it's a matter of security. Who knows who is behind that veil and what their intentions are! As has been said many times, you cannot go into a bank wearing a motorcycle helmet that covers most of your face so why should anyone be allowed to wear a veil that covers all but their eyes. You may interview someone for a job but have no idea that they are actually the person who turns up. If other Muslim countries can ban the veil then so should we. We bend too much for other people who elect to live here but don't want to integrate and follow our rules. This is NOT a Muslim country but Muslims are welcome to live here providing they make the effort as we have to do in their countries.Give and take. If I have the same right as these Muslim Women, what would society think if I went about the streets wearing a ski mask? Surly the point is, the Puritans were Christian were they not, but the wearers of the veil follow a different Faith. This is a Christian country, and the situation will never be resolved while they, and their alien faith, remain in this Christian land. Isn't the moral of this story that such things will never end!? - that we will have religious nutters in 500 years time too! Shakespeare had a hidden Catholic agenda, tho', so he's not a good base-line to judge the general feeling of the population by.